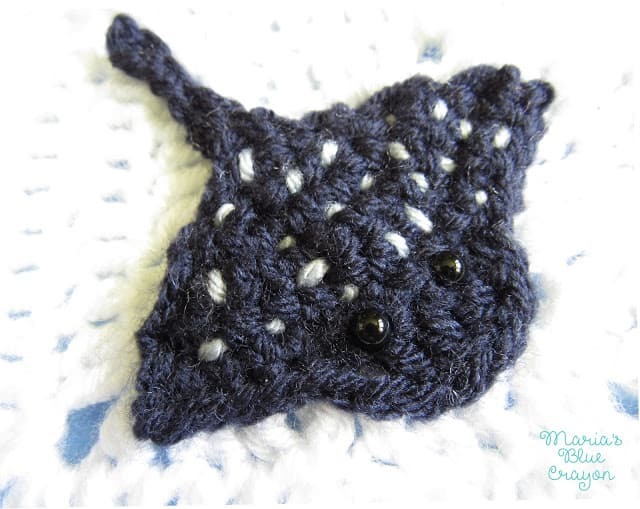 GET THE CROCHET STINGRAY APPLIQUE ALONG WITH THE GRANNY SQUARE PATTERN IN AN AD-FREE PDF DOWNLOAD HERE. OR SCROLL DOWN FOR THE FREE STINGRAY CROCHET PATTERN. The Stingray is the 8th square of my Ocean Afghan. To find all the information about this Afghan click here. 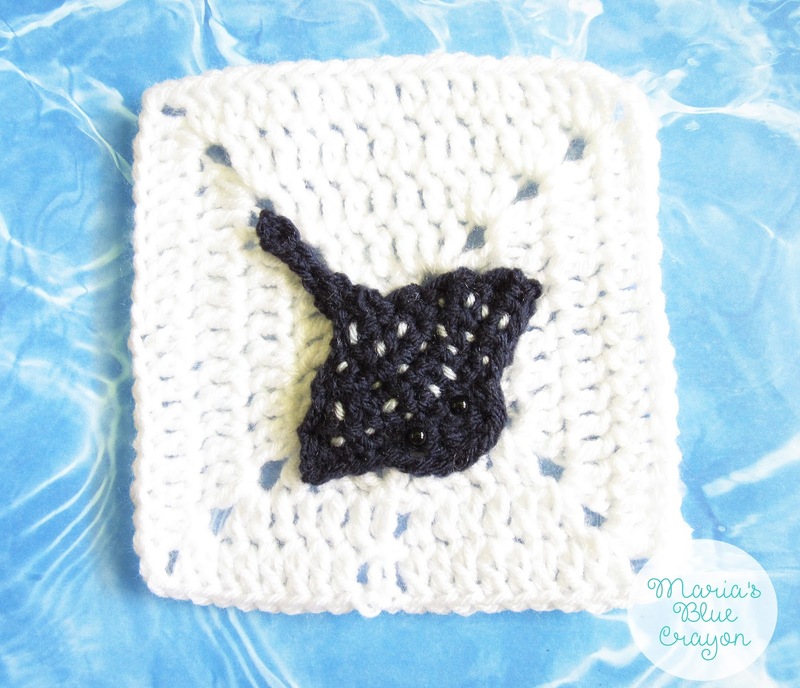 Say hello to my 8th granny square design – a stingray! I got my inspiration from Finding Nemo’s Mr. Ray. I love the spotted look of Mr. Ray and I wanted to incorporate that into this design! I think he’s very simple but will make a great addition to the other ocean friends I have currently designed. This 8th squares puts me past the half-way mark *happy dance* and I “only” have 7 more to go! I’m thrilled to be past the half way mark and every time I lay down my squares, I feel a sense of satisfaction. This afghan is coming together so beautifully with all the colors and I can’t wait to have it all pieced together! PIN TO YOUR CROCHET BOARD ON PINTEREST. Foundation single crochet technique will be used in this pattern for the tail. 6mm safety eyes are used, but can be substituted with french knots in black yarn. Attach navy yarn to Row 1, chain up 1, insert hook into next space, pull up a loop, YO, pull through one loop, YO, pull through both loops. That completes one foundation single crochet. Continue to foundation single crochet 4 more times. Fasten off. Using a tapestry needle and silver blue yarn, sew on spots on the body. How are you attaching the fish with yarn or thread and what color?